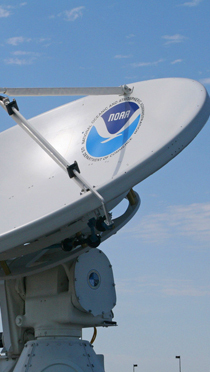 NOAA's Satellite and Information Services (NESDIS) recognizes the need for full and open exchange of environmental satellite data and products, as allowed and governed by relevant laws, international agreements, national and organizational policies and the availability of resources. This page contains instructions for submitting a Data Access Request Form and an overview of the review process. If available, users will be directed to sources of data that are external to NESDIS but still fulfill data requirements as specified in the Data Access Request Form. In addition, NESDIS will make best efforts to recommend alternative distribution sources for users requesting satellite data and/or products that are: (a) not approved for direct access to NESDIS dedicated distribution servers; or (b) not available through publicly available distribution services. Type of application for which the satellite data or products is required. A demonstrated timeliness requirement for near-real time satellite data and products to support operational user applications. The target length of time for processing a request is about two weeks but could take longer based upon the type of request. The Federal Information Security Management Act and the Office of Management and Budget Circular A-130 require management authorization of all information systems that store, process or transmit federal data. If requests are ultimately approved by the Data Access Review Board, in most cases an Interconnection Security Agreement (ISA) will be required between NOAA and the requesting party to formalize the connections. A system interconnection is defined as the connection between two or more IT systems for the purpose of exchanging data and information resources. The ISA documents the requirements for connecting the IT systems, describes the security controls that will be used to protect the system and data and contains a topological drawing of the interconnection. The ISA is sometimes coupled with a Memorandum of Understanding/Memorandum of Agreement between the two parties that have an interconnection. For further details on NOAA / NESDIS' Policy on Access and Distribution of Environmental Satellite Data and Products, Privacy Act Statement, System of Records Notices (SORN) and/or you have an interest in requesting NESDIS satellite data and products, please contact NESDIS.Data.Access@noaa.gov. Page updated on August 30, 2017.